In March, Cloud Talent Solution announced new functionality that enables job search by preferred commute time and mode of transit, including walking, cycling, driving, and public transportation. We also enhanced our job search capabilities in more than 100 languages. And we continue to hear from employers that finding and engaging a larger talent pool is a top priority, which means meeting job seekers where they are. In today’s era of agility, speed and innovation, companies must be able to adapt across every part of their business to keep up with competition, starting with their workforce.To help employers and recruitment platforms connect with candidates who need more flexibility, today we are announcing an improved job search experience that allows our customers to make remote work opportunities in the U.S. more discoverable on their career sites. This functionality supports users who search for jobs with terms like “work from home” or “WFH” and returns the relevant jobs that may be labeled differently as “remote” or “telecommute.”Job seekers have different lifestyle and geographic needs that require flexibility. Working from home can enable parents and caregivers to be more available to their families. It can help retain a high performing employee who regularly relocates as a military spouse. And it can help increase the loyalty of millennial and Generation Z employees who are much likelier to stay in a role for 5+ years if their company is flexible about where and when they work.Through a number of user studies, we learned that most remote jobs were not clearly labeled as such. And our customers have told us it is difficult to accurately detect and return remote opportunities when users enter “work from home” or related queries into their search box. By offering this capability to our customers, we hope to make remote work opportunities more discoverable to job seekers who need them.What remote work flexibility means for businessesHighmark Health is a national health and wellness organization whose more than 43,000 employees serve millions of Americans nationwide. Highmark Health offers diverse career opportunities to contribute to a remarkable health experience, across a wide variety of disciplines, including nursing, customer service, finance and IT. As an employer, Highmark Health invests heavily in building diverse talent pipelines, including students and new grads, veterans, and people with disabilities, because the organization believes that diverse perspectives drive a better employee and patient experience, as well as better business outcomes. By offering remote work opportunities, Highmark Health is able to attract a broader audience of job seekers who may require work location flexibility in order to do their best work.Highmark Health has integrated Cloud Talent Solution throughSymphony Talent to offer remote work and other inclusive job search functionality to all candidates who visit theircareer site.“Remote positions allow our organization to remove geography as a barrier and tap into talent markets that we would not otherwise have access to,” commented Karl Sparre, Vice President, Talent Solutions, Highmark Health. “Our collaboration with Google and Symphony Talent enables us to compete for top talent in the current record low unemployment market, as remote positions are critical to the success of our businesses that have a nationwide consumer presence.”“By infusing our clients’ career sites with the power of Google Cloud Talent Solution’s enhanced search capabilities, we are empowering our customers to transform their candidate experience into one that is more personalized and responsive,” said Roopesh Nair, President and CEO, Symphony Talent. “Google is driving new levels of talent marketing experiences, making it the ideal strategic partnership to accelerate our passion to deliver the right fit, quality talent to our clients.”RecruitMilitary connects organizations with veteran talent through over 30 products and services, all of which are fueled by their job board. Their job board, with over 1.4M members, is core to RecruitMilitary’s overall business and is powered by Google Cloud Talent Solution’s job search functionality. By offering an improved search experience for remote work opportunities on RecruitMilitary’s job board, job seekers in the military community can now discover more flexible jobs to suit their specific needs.“We’re excited about this feature as it enhances our ability to deliver meaningful jobs to important members of our military community, military spouses and veterans with limited mobility,” said Mike Francomb, Senior Vice President of Technology for RecruitMilitary and Bradley-Morris. “With this capability, these audiences will now have ease of access to opportunities that accommodate the unique aspects of their job search. Spouses can now connect with more portable career options as they move to support their service member spouse. With this new feature, veterans who prefer to or need to work from home will now have a path to opportunities that allow them to do so.”This new functionality supporting the discoverability of remote work opportunities is available to any site using Cloud Talent Solution to power its job search.And if you are an employer or running a job board or staffing agency and want to help more people find the right job opportunities on your site, visit our website to get started with Cloud Talent Solution today. Google designed Cloud TPUs from the ground up to accelerate cutting-edge machine learning (ML) applications, from image recognition, to language modeling, to reinforcement learning. And now, we’ve made it even easier for you to use Cloud TPUs for image segmentation—the process of identifying and labeling regions of an image based on the objects or textures they contain—by releasing high-performance TPU implementations of two state-of-the-art segmentation models, Mask R-CNN and DeepLab v3+ as open source code. Below, you can find performance and cost metrics for both models that can help you choose the right model and TPU configuration for your business or product needs.A brief introduction to image segmentationImage segmentation is the process of labeling regions in an image, often down to the pixel level. There are two common types of image segmentation:Instance segmentation: This process gives each individual instance of one or multiple object classes a distinct label. In a family photo containing several people, this type of model would automatically highlight each person with a different color.Semantic segmentation: This process labels each pixel of an image according to the class of object or texture it represents. For example, pixels in an image of a city street scene might be labeled as “pavement,” “sidewalk,” “building,” “pedestrian,” or “vehicle.”Autonomous driving, geospatial image processing, and medical imaging, among other applications, typically require both of these types of segmentation. And image segmentation is even an exciting new enabler for certain photo and video editing processes, including bokeh and background removal!High performance, high accuracy, and low costWhen you choose to work with image segmentation models, you’ll want to consider a number of factors: your accuracy target, the total training time to reach this accuracy, the cost of each training run, and more. To jump-start your analysis, we have trained Mask R-CNN and DeepLab v3+ on standard image segmentation datasets and collected many of these metrics in the tables below.Instance segmentation using Mask R-CNNFigure 1: Mask R-CNN training performance and accuracy, measured on the COCO datasetSemantic segmentation using DeepLab v3+Figure 2: DeepLab v3+ training performance and accuracy, measured on the PASCAL VOC 2012 datasetAs you can see above, Cloud TPUs can help you train state-of-the-art image segmentation models with ease, and you’ll often reach usable accuracy very quickly. At the time we wrote this blog post, the first two Mask R-CNN training runs and both of the DeepLab v3+ runs in the tables above cost less than $50 using the on-demand Cloud TPU devices that are now generally available.By providing these open source image segmentation models and optimizing them for a range of Cloud TPU configurations, we aim to enable ML researchers, ML engineers, app developers, students, and many others to train their own models quickly and affordably to meet a wide range of real-world image segmentation needs.A closer look at Mask R-CNN and DeepLab v3+In order to achieve the image segmentation performance described above, you’ll need to use a combination of extremely fast hardware and well-optimized software. In the following sections, you can find more details on each model’s implementation.Mask R-CNNMask R-CNN is a two-stage instance segmentation model that can be used to localize multiple objects in an image down to the pixel level. The first stage of the model extracts features (distinctive patterns) from an input image to generate region proposals that are likely to contain objects of interest. The second stage refines and filters those region proposals, predicts the class of every high-confidence object, and generates a pixel-level mask for each object.Figure 3: An image from Wikipedia with an overlay of Mask R-CNN instance segmentation results.In the Mask R-CNN table above, we explored various trade-offs between training time and accuracy. The accuracy you wish to achieve as you train Mask R-CNN will vary by application: for some, training speed might be your top priority, whereas for others, you’ll prioritize around training to the highest possible accuracy, even if more training time and associated costs are needed to reach that accuracy threshold.The training time your model will require depends on both the number of training epochs and your chosen TPU hardware configuration. When training for 12 epochs, Mask R-CNN training on the COCO dataset typically surpasses an object detection “box accuracy” of 37 mAP (“mean Average Precision”). While this accuracy threshold may be considered usable for many applications, we also report training results using 24 and 48 epochs across various Cloud TPU configurations to help you evaluate the current accuracy-speed trade off and choose an option that works best for your application. All the numbers in the tables above were collected using TensorFlow version 1.13. While we expect your results to be similar to ours, your results may vary.Here are some high-level conclusions from our Mask R-CNN training trials:If budget is your top priority, a single Cloud TPU v2 device (v2-8) should serve you well. With a Cloud TPU v2, our Mask R-CNN implementation trains overnight to an accuracy point of more than 37 mAP for less than $50. With a preemptible Cloud TPU device, that cost can drop to less than $20.Alternatively, if you choose a Cloud TPU v3 device (v3-8), you should benefit from a speedup of up to 1.7x over a Cloud TPU v2 device—without any code changes.Cloud TPU Pods enable even faster training at larger scale. Using just 1/16th of a Cloud TPU v3 Pod, Mask R-CNN trains to the highest accuracy tier in the table in under two hours.DeepLab v3+Google’s DeepLab v3+, a fast and accurate semantic segmentation model, makes it easy to label regions in images. For example, a photo editing application might use DeepLab v3+ to automatically select all of the pixels of sky above the mountains in a landscape photograph.Last year, we announced the initial open source release of DeepLab v3+, which as of writing is still the most recent version of DeepLab. 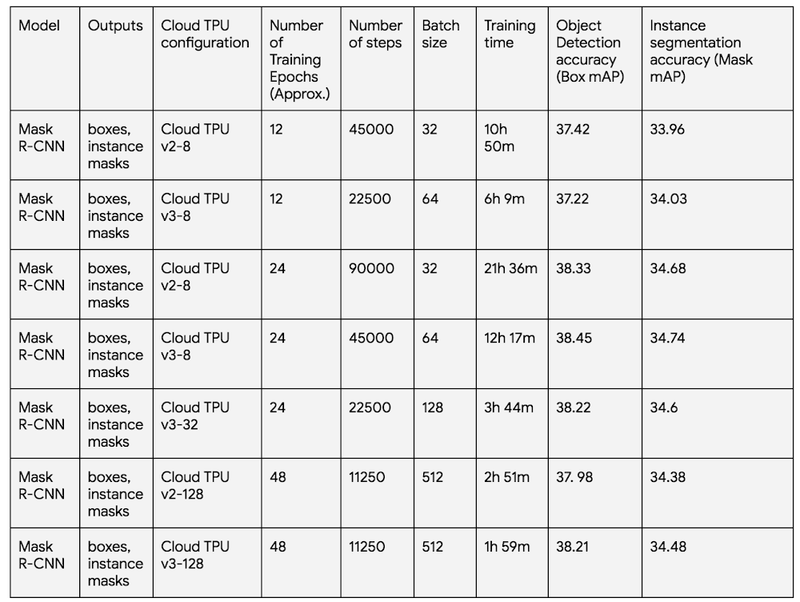 The DeepLab v3+ implementation featured above includes optimizations that target Cloud TPU.Figure 4: Semantic segmentation results using DeepLab v3+ [image from the DeepLab v3 paper]We trained DeepLab v3+ on the PASCAL VOC 2012 dataset using TensorFlow version 1.13 on both Cloud TPU v2 and Cloud TPU v3 hardware. Using a single Cloud TPU v2 device (v2-8), DeepLab v3+ training completes in about 8 hours and costs less than $40 (less than $15 using preemptible Cloud TPUs). Cloud TPU v3 offers twice the memory (128 GB) and more than twice the peak compute (420 teraflops), enabling a speedup of about 1.7x without any code changes.Getting started—in a sandbox, or in your own projectIt’s easy to start experimenting with both the models above by using a free Cloud TPU in Colab right in your browser:Mask R-CNN ColabDeepLab v3+ ColabYou can also get started with these image segmentation models in your own Google Cloud projects by following these tutorials:Mask R-CNN tutorial (source code here)DeepLab v3+ tutorial (source code here)If you’re new to Cloud TPUs, you can get familiar with the platform by following our quickstart guide, and you can also request access to Cloud TPU v2 Pods—available in alpha today. For more guidance on determining whether you should use an individual Cloud TPU or an entire Cloud TPU Pod, check out our comparison documentation here.AcknowledgementsMany thanks to the Googlers who contributed to this post, including Zak Stone, Pengchong Jin, Shawn Wang, Chiachen Chou, David Shevitz, Barrett Williams, Liang-Chieh Chen, Yukun Zhu, Yeqing Li, Wes Wahlin, Pete Voss, Sharon Maher, Tom Nguyen, Xiaodan Song, Adam Kerin, and Ruoxin Sang. Ruby on Rails won developers’ hearts by providing a platform for rapidly building database-backed web apps. Google Kubernetes Engine (GKE) takes the pain out of deploying and managing Kubernetes clusters, and provides a great on-ramp to the benefits of containers. However, learning how to package and deploy Ruby applications on GKE can be challenging, particularly when migrating existing production applications and their dataThe new Migrating Ruby on Rails apps on Heroku to GKE tutorial takes you through migrating a sample Ruby on Rails application hosted on Heroku to GKE step by step, explaining Kubernetes concepts along the way. You learn how to convert Heroku dynos to GKE nodes, migrate a Heroku Postgres database to Cloud SQL for PostgreSQL, package and test your Ruby on Rails app as a Docker container, deploy this container on GKE and finally scale it to meet your capacity needs. The resulting environment (shown in the diagram below) is replicated across multiple zones for high availability, making it suitable for production use.Much of the tutorial’s advice applies to migrating Ruby apps from any environment to GKE. There are also tips for overcoming common issues during database migrations and troubleshooting issues with containerized applications.Learn more about the many ways to run Ruby on Rails on Google Cloud Platform, and try migrating a Rails app to GKE today. Our Stackdriver Monitoring tool works on Google Cloud Platform (GCP), Amazon Web Services (AWS) and even on-prem apps and services with partner tools like Blue Medora’s BindPlane. Monitoring keeps metrics for six weeks, because the operational value in monitoring metrics is often most important within a recent time window. For example, knowing the 99th percentile latency for your app may be useful for your DevOps team in the short term as they monitor applications on a day-to-day basis.However, there’s a lot of value in a longer-term analysis over quarters or years. That long-term analysis may reveal trends that might not be apparent with short-term analysis. Analyzing longer-term Monitoring metrics data may provide new insights to your DevOps, infrastructure and even business teams. For example, you might want to compare app performance metrics from Cyber Monday or other high-traffic events against metrics from the previous year so you can plan for the next high-traffic event. Or you might want to compare GCP service usage over a quarter or year to better forecast costs. There might also be app performance metrics that you want to view across months or years.With our new solution guide, you can understand the metrics involved in analyzing long-term trends. The guide also includes a serverless reference implementation for metric export to BigQuery.Creating a Stackdriver reference architecture for longer-term metrics analysisHere’s a look at how you can set up a workflow to get these longer-term metrics:Monitoring provides a time series list API method, which returns collected time series data. Using this API, you can download your monitoring data for external storage and analysis. For example, using the Monitoring API, you could download your time series and then store it in BigQuery for efficient analysis.Analyzing metrics over a larger time window means that you’ll have to make a design choice around data volumes. Either you include each individual data point and incur the time and cost processing of each one, or you aggregate metrics over a time period, which reduces the time and cost of processing at the expense of reduced metrics granularity.Monitoring provides a powerful aggregation capability in the form of aligners and reducers available in the Monitoring API. Using aligners and reducers, you can collapse time-series data to a single point or set of points for an alignment period. Selecting an appropriate alignment period depends on the specific use case. One hour provides a good trade-off between granularity and aggregation.Each of the Monitoring metrics have a metricKind and a valueType, which describe both the type of the metric values as well as what the values represent (i.e., DELTA or GAUGE values). These values determine which aligners and reducers may be used during metric aggregation.For example, using an ALIGN_SUM aligner, you can collapse your App Engine http/server/response_latencies metrics for each app in a given Stackdriver Workspace into a single latency metric per app per alignment period. If you don’t need to separate the metrics by their associated apps, you can use an ALIGN_SUM aligner combined with a REDUCE_PERCENTILE_99 reducer to collapse all of your App Engine latency metrics into a single value per alignment period, as shown here:For more considerations on metrics, metric types, and exporting to BigQuery for analysis, check out our solution guide.Be sure to let us know about other guides and tutorials you’d like to see using the “Send Feedback” button at the top of the solution page. And you can check out our full list of how-to solutions for all GCP products. Editor’s note: As we see computing and data needs grow exponentially, we’re pleased to hear today from ClioSoft, which offers system-on-chip (SoC) design data and IP management solutions. Their platform is used widely in the semiconductor industry. Running ClioSoft’s SOS7 design management platform on Google Cloud Filestore is simple and can provide great performance.Along with hearing ClioSoft’s story, we’re also excited that Cloud Filestore is now generally available. Read on for details on how ClioSoft tested Cloud Filestore against typical on-premises performance for its customer needs. Learn more here about Cloud Filestore.Integrated circuits (ICs) powering today’s automotive, mobile and IoT applications are enormously powerful and complex. To develop an IC, design teams often undergo an extended engineering and testing process. They’re often faced with tight schedules to bring products to market and compete with consumer demands, and are borrowing the best practices of software design to speed development.However, IC design environments are notably different than software design environments because they rely heavily on shared files. A typical design engineer’s work area consists of large number of binary files, which tend to be rather large, often numbering in GB size. These files are often generated by electronic design automation (EDA) tools. Some of these files are generated only a few times during the life of the project, but used by almost all members of the project very often. In addition, there are usually third-party libraries and process design kits (PDKs) that the entire team relies on for practically each simulation or verification run. This setup requires a lot of high-performance storage to be accessible on several compute machines, and the productivity of teams designing integrated circuits can easily be impacted without enough high-performance storage.We know from what our customers tell us that optimization of storage resources is one of the top criterion in the design environment, since the design data size is so large. Our SOS7 design management platform creates shared smart cache areas where all design files not being modified are hosted. User access to these design files is provided by tool-managed Linux symbolic links in the user’s working directory. This is one key feature used by most of our customers to create links to the cache workspace, since it can help reduce up to 90% of the design team’s storage requirements.We’re always eager to optimize the user’s design environment, so we used Google’s Cloud Filestore, recently made generally available, to replicate a typical IC design environment in the cloud with high performance.Using a typical IC design environmentA typical design environment that we see design automation teams use successfully looks like this:The environment generally works this way:The high-performance NAS file server exports volumes using NFS protocolEach machine (servers and workstations) mounts the NAS-exported NFS volumesWorkstations rendering high-end graphics and the server access large data stored on the NFS volumes for typical activitiesDesign tools, such as layout editors, require rendering complex graphics displaying millions of polygons. The responsiveness of the toolset directly affects user experience. Another challenge of this on-premises setup is that shared NFS/NAS drives can easily be a bottleneck. Local drives offer strong performance, but the complex logistics involved in replicating a large amount of ever-changing data on several local drives means it’s not a practical solution for most customers.Setting this design environment up in the cloud brings the promise of high scalability, high availability, and reliability that is difficult (if not impossible) to achieve with an in-house design environment. The challenge, however, is how this complex design environment can be replicated and perform in the cloud.Using a cloud-based IC design environmentWe tried recreating a typical design environment using Google Cloud Platform (GCP), specifically Cloud Filestore and Compute Engine, to see if IaaS is viable. You can see how we set up the environment here:Setting up the GCP environmentWe set up Cloud Filestore and the Compute Engine instances using the web interface. We used readily available documentation to set up the environment in a couple of days, shown here:Once the Cloud Filestore instance was available, we simply needed to:1. Install nfs-utils> yum install nfs-utils2. Add the following line to /etc/fstab on the Compute Engine instances10.198.128.10:/us_central1_nas /nfs_driv nfs defaults 0 03. Run the Unix mount command.> mount -aThe data shared on the Cloud Filestore instance was available on the Compute Engine instances, ready to use.We started our SOS primary and cache services and used the SOS client to create design workspaces on the Cloud Filestore instance. We were also able to create links-to-cache workspaces, which is a key requirement for our customers. A typical EDA environment with SOS design management was up and fully functional in a short time. We needed only a basic ISP-powered network and open-source tools like VNC for remote access.Cloud performance testingWe also ran a couple of test suites to simulate typical design management operations that a team would do during the course of a project. The SOS7 test suites 13K and 74K are a part of ClioSoft’s benchmarking that simulates typical customer workflows. Both these design suites represent design activity on an image sensor chip used to develop high-resolution, low-light devices.We ran these test suites against an on-premises network that we built to emulate the design environments at a typical ClioSoft customer.The following table shows some performance results, with our cloud design environment on GCP running up to 75% faster. Note that this isn’t an apples-to-apples comparison, since the results are highly dependent on the on-premises infrastructure and the GCP configuration.We noticed in benchmark testing that there was a positive effect on performance as the data moved from a local drive to a shared drive. In a typical customer environment, NAS/NFS shared drives are often the primary bottleneck affecting EDA tool performance. Tools perform much better if the on-premises environments use local disks instead of shared NFS/NAS filers. However, the complex logistics involved in replicating large amounts of quickly changing data on several local drives means it’s not a practical solution for most customers. The following table quantifies and compares performance degradation on a shared drive (NAS/Cloud Filestore) as compared to a local drive [direct-attached storage (DAS)].Performance degrades by almost 3x when an on-premises network uses shared NFS/NAS storage. The most notable discovery was that Cloud Filestore provides a near-local drive performance level while providing all the benefits of a shared drive.We found that using GCP with Cloud Filestore is a viable solution to replicate a typical IC design environment in the cloud. It brings high performance, high reliability and high availability to the design environment. The performance comparison between an on-premises network and GCP isn’t exactly one-to-one—the compute resources available in these environments are significantly different. However, the fact that there is virtually no difference between running these design tools on standard persistent disk and Cloud Filestore is a big discovery if you’re implementing an IC design environment.Find out more here about designing integrated circuits with ClioSoft SOS7, and learn more here about Cloud Filestore.Looking for the similarly named Cloud Firestore? Learn about that NoSQL database here. 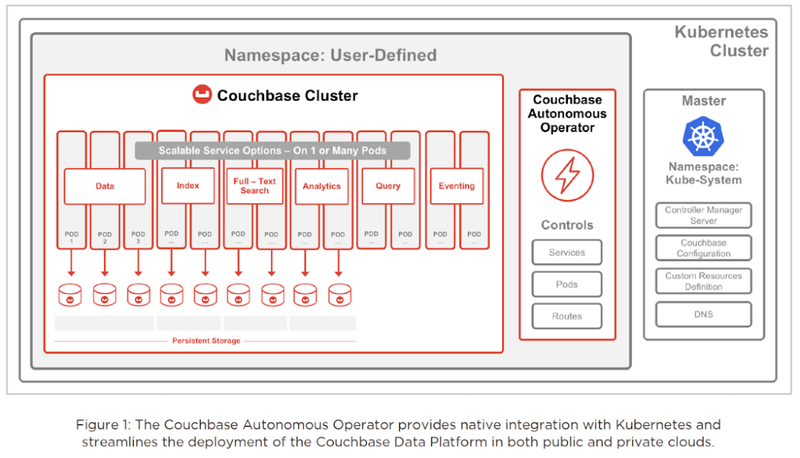 Editor’s note: Today we’re hearing from Couchbase, a database partner that’s built a NoSQL, open source-centric database that can run on Kubernetes. Read on for more about their architecture and how developers use their technology.Building and running modern web, mobile, and IoT applications has created a new set of technology requirements. Relational databases don’t work for these new requirements, because these apps need better agility, scalability, and performance than is possible when a database is tied to a single physical/VM instance. So we’ve seen many enterprises turning to NoSQL database technology, since it’s designed to manage unstructured and semi-structured data like web content, multimedia files, XML, and more.Couchbase Server is a scale-out NoSQL database that’s designed for containerized, multi-cloud/hybrid-cloud, microservices-based infrastructures. The core architecture is designed to simplify building modern applications with a flexible data model, a SQL-based query language, and a secure core database platform designed for high availability, scalability, and performance. We’ve seen developers build asset tracking, content management, file service and other apps on Couchbase because it lets them iterate fast, read and write JSON documents, get low-latency access to data, and support millions of concurrent users. Plus, using this type of NoSQL database means they can support global users at any time, and deploy into multiple data centers with an active-active configuration.Couchbase is the first NoSQL vendor to have a generally available, production-certified operator for Kubernetes platforms such as Google Kubernetes Engine (GKE). The Couchbase Autonomous Operator lets you more quickly adopt the Couchbase database in production to build microservices-based apps. From there, DevOps teams can focus on code, not infrastructure, and build better user experiences. Using the Couchbase Autonomous OperatorManaging stateful applications such as Couchbase Server and other databases in containers is a challenge, since it requires application domain knowledge to correctly scale, upgrade, and reconfigure, while also protecting against data loss and unavailability. We decided to build this application-specific operational knowledge into our software that uses the Kubernetes abstractions to help run and manage the application correctly.The goal of the Couchbase Autonomous Operator is to fully self-manage one or more Couchbase deployments so that you don’t need to worry about the operational complexities of running Couchbase. Not only is the Couchbase Autonomous Operator designed to automatically administer the Couchbase cluster, it can also self-heal, self-manage and automatically upgrade the cluster according to Couchbase best practices. Developers end up with more time to spend on the app itself, and have full control over the database and data. 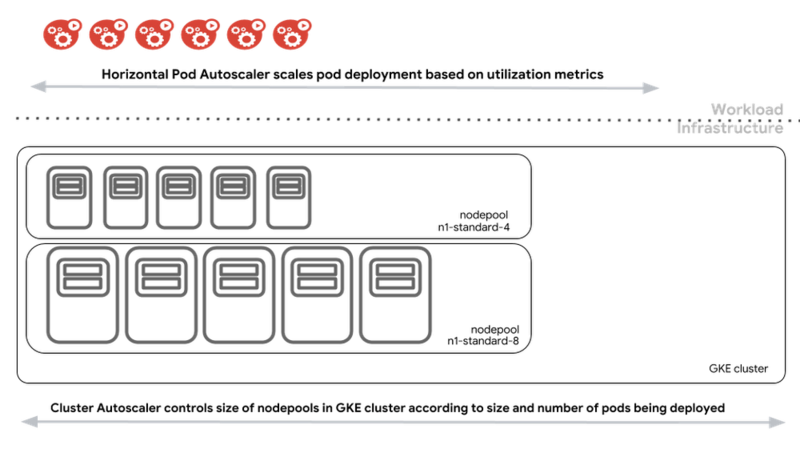 The Couchbase Autonomous Operator architecture consists of server pods, services, and volumes. When a Couchbase cluster gets deployed, the operator creates additional Kubernetes resources to facilitate its deployment. The resources originating from the Couchbase Autonomous Operator are labeled to make it easier to list and describe the resources belonging to a specific cluster. You can see here how the Couchbase Autonomous Operator works and integrates with Kubernetes.Getting started with Couchbase and GCPHere’s a look at more on using Couchbase:You can deploy Couchbase on GKE quickly through the GCP Marketplace for Kubernetes. Once you stand up a Couchbase cluster using Kubernetes, it’ll automatically be monitored and managed on top of GKE and GCP. With this support for Kubernetes and containers, you can now deploy applications more frequently and efficiently with faster load times. You can adopt this GKE and Couchbase microservices architecture for both stateful and stateless workloads, and run databases in containers along with the rest of your services in the same Kubernetes platform.We aim to make management of Couchbase clusters a thing of the past so that users can spend time building applications instead of managing their infrastructure.Kubernetes applications (like Couchbase Autonomous Operator) available in GCP Marketplace are the fastest way for GCP users to run end-user applications optimized for GKE. Visit GCP Marketplace today to set up a Couchbase cluster on GKE or take a test drive, or learn more about getting Couchbase up and running through the GCP Marketplace. Editor’s note: This is one of the many posts on unique differentiated capabilities in Google Kubernetes Engine (GKE). Find the first post here for details on GKE Advanced.Whether you run it on-premises or in the cloud, Kubernetes has emerged as the de facto tool for scheduling and orchestrating containers. But while Kubernetes excels at managing individual containers, you still need to manage both your workloads and the underlying infrastructure to make sure Kubernetes has sufficient resources to operate (but not too many resources). To do that, Kubernetes includes two mature autoscaling features: Horizontal Pod Autoscaler for scaling workloads running in pods, and Cluster Autoscaler to autoscale—you guessed it—your clusters. Here is how they relate to one another:GKE, our cloud-hosted managed service, also supports Horizontal Pod Autoscaler and Cluster Autoscaler. 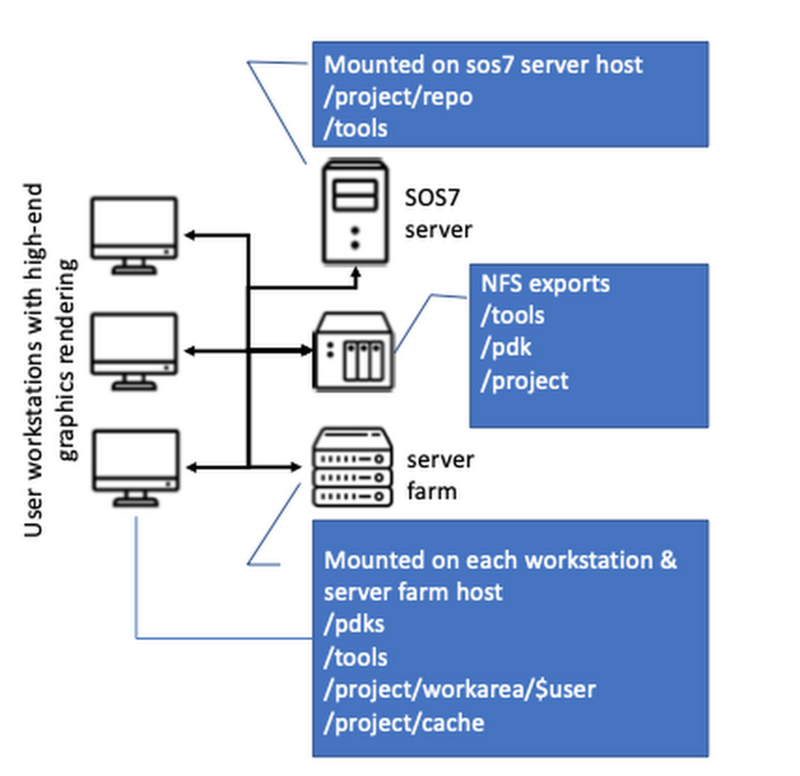 But unlike open-source Kubernetes, where cluster autoscaler works with monolithic clusters, GKE uses node pools for its cluster automation. Node pools are a subset of node instances within a cluster that all have the same configuration. This lets administrators provision multiple node pools of varying machine sizes within the same cluster that the Kubernetes scheduler then uses to schedule workloads. This approach lets GKE use the right size instances from the get-go to avoid creating nodes that are too small to run some pods, or too big and waste unused compute space.Although Horizontal Pod Autoscaler and Cluster Autoscaler are widely used on GKE, they don’t solve all the challenges that a DevOps administrator may face—pods that are over- or under-provisioned for CPU and RAM, and clusters that don’t have the appropriate nodes in a node pool with which to scale.For those scenarios, GKE includes two advanced features: Vertical Pod Autoscaler, which automatically adjusts a pod’s CPU and memory requests, and Node Auto Provisioning, a feature of Cluster Autoscaler that automatically adds new node pools in addition to managing their size on the user’s behalf. First introduced last summer in alpha, both of these features are now in beta and ready for you to try out as part of the GKE Advanced edition, introduced earlier this week. Once these features become generally available, they’ll be available only through GKE Advanced, available later this quarter.Vertical Pod Autoscaler and Node Auto Provisioning in actionTo better understand Vertical Pod Autoscaler and Node Auto Provisioning, let’s look at an example. Helen is a DevOps engineer in a medium-sized company. She’s responsible for deploying and managing workloads and infrastructure, and supports a team of around 100 developers who build and deploy around 50 various services for the company’s internet business.The team deploys each of the services several times a week across dev, staging and production environments. And even though they thoroughly test every single deployment before it hits production, the services are occasionally saturated or run out of memory.Helen and her team analyze the issues and realize that in many cases the applications go out of memory under a heavy load. This worries Helen. Why aren’t these problems caught during testing? She asks her team about how the resource requests are being estimated and assigned, but to her surprise, finds that no one really knows for sure how much CPU and RAM should be requested in the pod spec to guarantee the stability of workload. In most cases, an administrator set the memory request a long time ago and never changed it…until the application crashed, and they were forced to adjust it. Even then, adjusting the memory request isn’t always a systematic process—sometimes the admin regularly tests the app under heavy load, but more often they simply add some more memory. How much memory exactly? Nobody knows.In some ways, the Kubernetes CPU and RAM allocation model is a bit of a trap: Request too much and the underlying cluster is less efficient; request too little and you put the entire service at risk. Helen checks the GKE documentation and discovers Vertical Pod Autoscaler.Vertical Pod Autoscaler is inspired by a Google Borg service called AutoPilot. It does three things:1. It observes the service’s resource utilization for the deployment.2. It recommends resource requests.3. It automatically updates the pods’ resource requests, both for new pods as well as for current running pods.A functional schema of the GKE Vertical Pod AutoscalerBy turning on Vertical Pod Autoscaler, deployments won’t run out of memory and crash anymore, because every pod request is adjusted independently of what was set in the pod spec. Problem solved!Vertical Pod Autoscaler solves the problem of pods that are over- or under-provisioned, but what if it requests far more resources in the cluster? Helen returns to the GKE documentation, where she is relieved to learn that Cluster Autoscaler is notified ahead of an update and scales the cluster so that all re-deployed pods find enough space in the cluster. But what if none of the node pools has a machine type big enough to fit the adjusted pod? Cluster Autoscaler has a solution for this too: Node Auto Provisioning automatically provisions an appropriately sized node pool if it is needed.Putting GKE autoscaling to the testHelen decides to set up a simple workload to familiarize herself with Vertical Pod Autoscaling and Node Auto Provisioning. She creates a new cluster where both are enabled.Helen knows that by activating this functionality at cluster creation time, she is making sure that both features are available to that cluster—she won’t need to enable them later.Helen deploys a simple shell script that uses a predictable amount of CPU. She sets her script to use 1.3 CPU, but only sets cpu: “0.3” in the pod’s resource request.Here is the manifest:deployment.yamlAnd here is how she creates the deployment.Please note that at this point no Vertical Pod Autoscaler is active on the deployment. After a couple of minutes Helen checks what is happening with her deployment. Apparently both of the deployed pods went way above allotted CPU, consuming all of the processing power of their respective nodes—much like what happens with some of the company’s production deployments.Helen decides to explore what happens if she enables Vertical Pod Autoscaler. First, she enables it in recommendation mode, without it taking any action automatically. She constructs a vpa.yaml file and creates a Vertical Pod Autoscaler in “Off” mode.vpa.yamlCreate Vertical Pod Autoscaler:She waits a couple of minutes and then asks it for recommendations.After observing the workload for a short time, Vertical Pod Autoscaler provides some initial low-confidence recommendations for adjusting the pod spec, including the target as well as upper and lower bounds.Then, Helen decides to enable the automatic actuation mode, which applies the recommendation to the pod by re-creating it and automatically adjusting the pod request. This is only done when the value is below the lower bound of the recommendation and only if allowed by the pod’s disruption budget.vpa_auto.yamlNote: This could also have been done using kubectl edit vpa and changing updateMode to Auto on the fly.While Vertical Pod Autoscaler gathers data to generate its recommendations, Helen checks the pods’ status using filters to look just at the data she needs.To Helen’s surprise, the cluster that had been running only one-core machines is now running pods with 1168 mCPU.Using Node Auto Provisioning, Cluster Autoscaler created two high-CPU machines and automatically deployed pods there. Helen can’t wait to run this in production.Getting started with Vertical Pod Autoscaling and Node Auto ProvisioningManaging a Kubernetes cluster can be tricky. Luckily, if you use GKE, these sophisticated new tools can take the guesswork out of setting memory requests for nodes and sizing your clusters. To learn more about Vertical Pod Autoscaler and Node Auto Provisioning, check out the GKE documentation, and be sure to reach out to the team with questions and feedback.Have questions about GKE? Contact your Google customer representative for more information, and sign up for our upcoming webcast, Your Kubernetes, Your Way Through GKE. In the cloud, establishing trust in your environment is multifaceted, involving hardware and firmware, as well as host and guest operating systems. Unfortunately, threats like boot malware or firmware rootkits can stay undetected for a long time, and an infected virtual machine can continue to boot in a compromised state even after you’ve installed legitimate software.Last week at Google Cloud Next ’19, we announced the general availability of Shielded VM—virtual machine instances that are hardened with a set of easily configurable security features that assure you that when your VM boots, it’s running a verified bootloader and kernel.Shielded VM can help you protect your system from attack vectors like:Malicious guest OS firmware, including malicious UEFI extensionsBoot and kernel vulnerabilities in guest OSMalicious insiders within your organizationTo guard against these kinds of advanced persistent attacks, Shielded VM uses:Unified Extensible Firmware Interface (UEFI): Ensures that firmware is signed and verifiedSecure and Measured Boot: Help ensure that a VM boots an expected, healthy kernelVirtual Trusted Platform Module (vTPM): Establishes a root-of-trust, underpins Measured Boot, and prevents exfiltration of vTPM-sealed secretsIntegrity Monitoring: Provides tamper-evident logging, integrated with Stackdriver, to help you quickly identify and remediate changes to a known integrity stateGemalto, a global security company focused on financial services, enterprise, telecom, and public sectors, turned to Shielded VM for its SafeNet Data Protection On Demand Cloud HSM solution, which provides a wide range of cloud HSM and key management services through a simple online marketplace.”Shielded VM lets us better protect sensitive applications in the cloud,” said Raphaël de Cormis, VP Innovation at Gemalto. “Using Shielded VM, we envision our customers get increased protection from remote attacks and can meet strict regulatory requirements for data protection and encryption key ownership. And the point/click/deploy model of Shielded VM makes increasing security quick and simple.”Image availabilityShielded VM is available in all of the same regions as Google Compute Engine, and there is no separate charge for using it. Shielded VM is available for the following Google-curated images:CentOS 7Container-Optimized OS 69+Red Hat Enterprise Linux 7Ubuntu 16.04 LTS (coming soon)Ubuntu 18.04 LTSWindows Server 2012 R2 (Datacenter Core and Datacenter)Windows Server 2016 (Datacenter Core and Datacenter)Windows Server 2019 (Datacenter Core and Datacenter)Windows Server version 1709 Datacenter CoreWindows Server version 1803 Datacenter CoreWindows Server version 1809 Datacenter CoreYou can also find Shielded VM in the GCP Marketplace. These images, brought to you in collaboration with the Center for Internet Security (CIS), include:CIS CentOS Linux 7CIS Microsoft Windows Server 2012 R2CIS Microsoft Windows Server 2016CIS Red Hat Enterprise Linux 7CIS Ubuntu Linux 18.04″Bringing CIS Hardened Images to Shielded VM gives users a VM image that’s been both hardened to meet our CIS Benchmarks, and that’s verified to protect against rootkits,” said Curtis Dukes, Executive Vice President of Security Best Practices at CIS. “These additional layers of security give customers a platform they can trust to protect their critical applications.”And if you prefer to import a custom image, Shielded VM now lets you transform an existing VM into a Shielded VM that runs on GCP, bringing verifiable integrity and exfiltration resistance to your existing images.Getting startedIt’s easy to get started with Shielded VM. In the GCP Console, when you’re creating a new VM instance or instance template, simply check the “Show images with Shielded VM features” checkbox.Next, you can adjust your Shielded VM configuration options under the Security tab. Here you can gain more granular control over Shielded VM functionality, including the option to enable or disable Secure Boot, vTPM, and integrity monitoring. By default, vTPM and integrity monitoring are enabled; Secure Boot requires explicit opt-in.If you’re looking for additional centralized and programmatic control over your organization’s VM instances, we’ve also made a new organization policy available for Shielded VM. This constraint, when enabled, requires all new Compute Engine VM instances to use shielded disk images and to enable vTPM and integrity monitoring.All functionality exposed via the GCP Console is also available using gcloud.What’s next?As methods for attackers to persist on and exfiltrate from VM instances grow more sophisticated, so too must your defenses. Shielded VM allows you to stay one step ahead of the game by leveraging the security benefits of UEFI firmware, Secure Boot, and vTPM. To learn more, please check out the Shielded VM documentation.You can also join the conversation in the Shielded VM discussion group and make feature suggestions here. We look forward to hearing from you and helping you harden your cloud infrastructure! 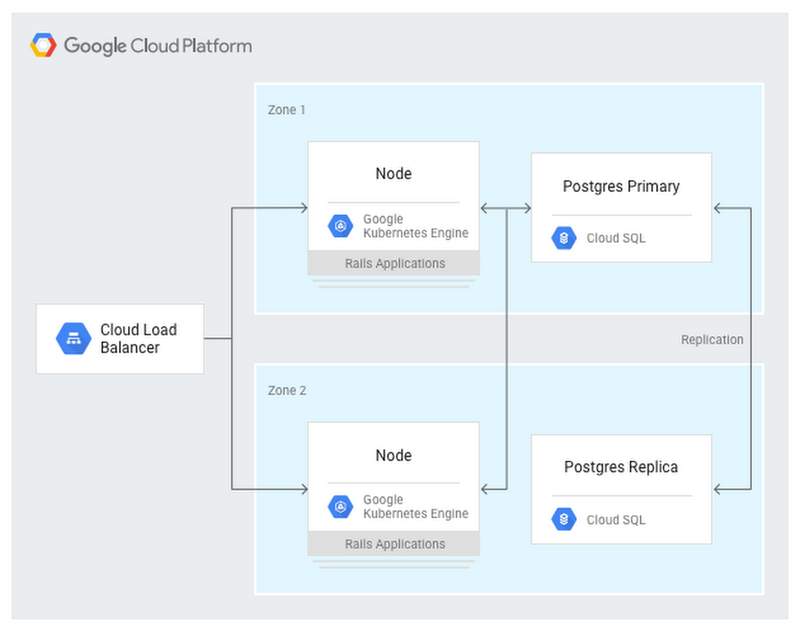 As you deploy Google Cloud Platform (GCP) services in Google Cloud, you need centralized visibility into what resources are running and their security state. 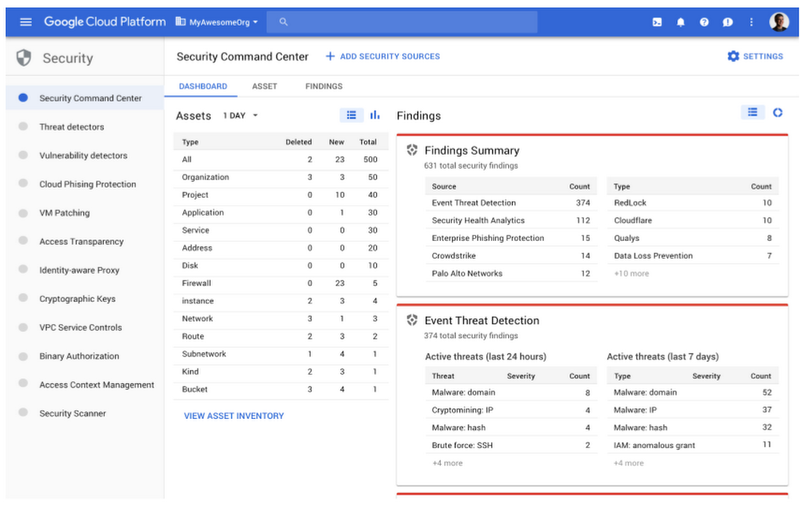 You also need to know if there has been anomalous activity and how to take action against it.Last week at Google Cloud Next ‘19, we announced the general availability of Cloud Security Command Center (Cloud SCC), a security management and data risk tool for GCP resources that helps you prevent, detect, and respond to threats from a single pane of glass.Cloud SCC helps you identify misconfigured virtual machines, networks, applications, and storage and act on them before they damage your business. Cloud SCC has built-in threat detection services, including Event Threat Detection, that can quickly surface suspicious activity or compromised resources. You can also use it to reduce the amount of time it takes to respond to threats by following actionable recommendations or exporting data to your security information and event management (SIEM) system.Let’s take a deeper look at how to use Cloud SCC to prevent, detect, and respond to threats.Prevent threats with visibility and control over your cloud data and servicesThe cloud makes it easier for anyone in your IT department to create a service. However, if these services are not deployed through your central IT department, you may be unaware of what services are running in GCP and how they are protected. Cloud SCC gives you visibility into what GCP services you are running on Google Cloud, including App Engine, BigQuery, Cloud SQL, Cloud Storage, Compute Engine, Cloud Identity and Access Management (IAM) policies, Google Kubernetes Engine, and more.With this visibility, you can quickly understand how many projects you have, what resources are deployed, where sensitive data is located, which service accounts have been added or removed, and how firewall rules are configured. It’s also easy to see if users outside of your designated domain, or GCP organization, have access to your resources.Besides giving you visibility into your GCP assets, Cloud SCC tracks changes to your assets so you can quickly act on unauthorized modifications. You can also view new, deleted, and total assets for within a specific time period or view resources at an organizational or project level. Cloud SCC generates notifications when changes occur and trigger Cloud Functions from a Cloud SCC query.Oilfield services company Schlumberger uses Google Cloud to help them safely and efficiently manage hydrocarbon exploration and production data. “Adopting Google’s Cloud Security Command Center enables an automated inventory of our numerous assets in GCP,” said Jean-Loup Bevierre, Cyber Security Engineering Manager at Schlumberger. “It provides us with a comprehensive view of their rapidly evolving running status, configuration and external exposure. This is a key enabler for us to proactively secure these resources and engineer solutions for our next-gen SOC.”In addition to giving you visibility into your GCP assets in Google Cloud and when changes are made, Cloud SCC can help you see resources that have been misconfigured or have vulnerabilities—before an attacker can exploit them.Available today in alpha, Cloud SCC’s Security Health Analytics capability assesses the overall security state and activity of your virtual machines, network, and storage. You can see issues with public storage buckets, open firewall ports, stale encryption keys, or deactivated security logging. To learn more about this capability, visit our documentation. To get started with this new capability, sign up for the alpha program.Another native capability that helps you prevent threats is Cloud Security Scanner. This scanner can detect vulnerabilities such as cross-site-scripting (XSS), use of clear-text passwords, and outdated libraries in your App Engine apps. It is generally available for App Engine and now available in beta for Google Kubernetes Engine (GKE) and Compute Engine.Detect threats targeting your GCP assetsIt takes an enterprise 197 days, on average, to detect a threat, but it only takes an attacker hours to gain access to your environment, causing an average of $3.86 million dollars worth of damage, according to a Ponemon Institute study.This does not have to be your reality if you use Cloud SCC’s integrated threat detection services.Available today in beta, Event Threat Detection scans your Stackdriver security logs for high-profile indicators that your environment has been compromised. Event Threat Detection uses industry-leading threat intelligence, including Google Safe Browsing, to detect malware, cryptomining, unauthorized access to GCP resources, outgoing DDoS attacks, port scanning, and brute-force SSH. Event Threat Detection sorts through large quantities of logs to help you identify high-risk incidents and focus on remediation. For further analysis, you can send findings to a third-party solution, such as a SIEM, using Cloud Pub/Sub and Cloud Functions. Sign up for the beta program today.Cloud Anomaly Detection, another built-in Cloud SCC service, can detect leaked credentials, cryptomining, unusual activity, hijacked accounts, compromised machines used for botnets or DDoS attacks, and anomalous data activity. In just a few clicks, you can find out more information about the attack and follow actionable recommendations.Respond to threats targeting your GCP assetsWhen a threat is detected, we know that every second counts. Cloud SCC gives you several ways to respond to threats, including updating a configuration setting on a VM, changing your firewall rules, tracking an incident in Stackdriver Incident Response Management or pushing security logs to a SIEM for further analysis.Meet your security needs with a flexible platformWe understand that you have investments in security solutions for both on-premises and other cloud environments. Cloud SCC is a flexible platform that integrates with partner security solutions and Google security tools.Partner solutions surface vulnerabilities or threats directly into Cloud SCC. Now you can see findings from Google security tools and partner tools in one location and quickly take action. You can also move from the Cloud SCC dashboard into third-party consoles to remediate issues.We’re excited to share today that Acalvio, Capsule8, Cavirin, Chef, Check Point CloudGuard Dome 9, Cloudflare, CloudQuest, McAfee, Qualys, Reblaze, Redlock by Palo Alto Networks, StackRox, Tenable.io, and Twistlock are running their security services on Google Cloud and integrate into Cloud SCC. Find out more about how Capsule8, Cavirin, CloudQuest, McAfee, Reblaze, and Cloud SCC work together.Cloud SCC also integrates with GCP security tools, including Access Transparency, Binary Authorization, Cloud Data Loss Prevention (DLP) API, Enterprise Phishing Protection, and the open-source security toolkit Forseti, letting you view and take action on the information provided by these tools.Access Transparency gives you near real-time logs when GCP administrators access your content. Gain visibility into accessor location, access justification, or the action taken on a specific resource from Cloud SCC.Binary Authorization ensures only trusted container images are deployed on GKE. With Cloud SCC, it’s easy to see if you are running containers with trusted or untrusted images and take action.Cloud DLP API shows storage buckets that contain sensitive and regulated data. Cloud DLP API can help prevent you from unintentionally exposing sensitive data and ensure access is conditional.Forseti integrates with Cloud SCC to help you keep track of your environment, monitor and understand your policies, and provide correction.Enterprise Phishing Protection reports URLs directly to Google Safe Browsing and publishes phishing results in the Cloud SCC dashboard, making it your one-stop shop to see and respond to abnormal activity in your environment and respond.Cloud SCC pricingThere is no separate charge for Cloud SCC. However, you will be charged if you upload more than 1 GB per day of external findings into Cloud SCC. In addition, some detectors that are integrated into Cloud SCC, such as Cloud DLP API, charge by usage. Learn more on the DLP API pricing page.Get started todayThere are lots of ways to start taking advantage of Cloud SCC.Enable it from the GCP Marketplace and start using for free.Learn more about Cloud SCC by reading the documentation.Watch Cloud SCC in action in this session from Next ‘19.